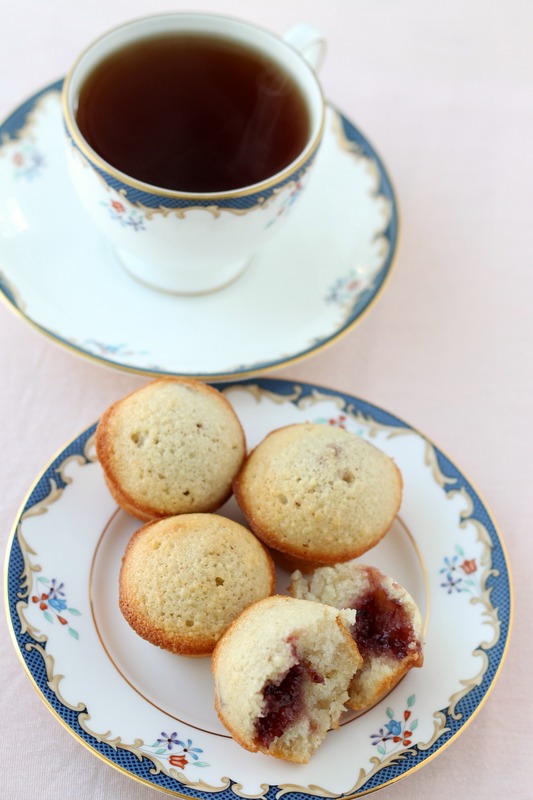 Say hello to a very elegant Valentine’s Day treat that is perfect for enjoying with a hot cup of tea. These popped out to us recently in our Martha Stewart’s Cupcakes book. The question is, why on earth did we wait several years to make these? They may possible win the prize for the most delicious dessert we have made recently! They are supposed to have a whole pitted cherry in the center, but in the middle of winter, when life doesn’t give you cherries, you don’t make cherry-filled cupcakes. So, we instead filled them with jam for a more year-round-friendly option and found the results great. Any type of jam would work, but we recommend some sort of berry, preferably cherry. The cake itself is tender with a lovely almond-flavored hint from almond flour. These would be fun to serve as a treat at a party with a scoop of vanilla ice cream, or just for eating plain while reading a book on a rainy day! Preheat oven to 400 degrees. Brush 30 cups of 2 mini-muffin tins with butter (we recommend melting a little butter to make this easier), and dust lightly with flour. Melt butter in a skillet over medium-high heat. When it begins to bubble, reduce heat to medium. Cook, swirling occasionally, until butter has lightly browned. Skim foam from top, and remove skillet from heat. Whisk together flour, almond flour, sugar, and salt in a bowl. Add egg whites, and whisk until smooth. Stir in kirsch. Pour in butter, leaving any burnt sediment in skillet, and whisk to combine. Let stand for 20 minutes. Put 1 tablespoon batter into each buttered muffin cup, filling about halfway. Spoon a little jam (about a half a teaspoon) onto each cupcake, and gently spread the batter over it. Bake until a toothpick comes out clean and cakes are golden brown, 12 to 15 minutes. Let cool 10 minutes. Run a knife around edges to loosen, and unmold. Cakes can be stored in airtight containers at room temperature overnight. Enjoy!